Best explanation of tides I have found in a while. I turned it off at time 0:18seconds. I have no patience for artists of deceit. But he didn't start with the deceit until later on in the video. Which deceit are you referring to? He openly tells you when the diagrams are exadurated for the sake of making the concept understandable as well as telling you why the assumptions are made. I already said: at time 0:18seconds. What do you see at that time??!?? Now having re-watched the 1st 20 seconds of that video, I realize that I should have turned it off much sooner: as soon as the actor-shill mentioned the word "gravity" in his leading question. At 0:18 into the video you see the words "Space Time" superimposed over a space-themed background. Space Time is the name of the series, this is simply an episode of it. This is merely an educational video. You have no obligation to watch it. It was posted for those who want to learn. If you are not one of them, carry on. He was presumably referring to the 0:18 mark, as opposed to another point in time that happens to be shortly after the mark. The part that shows up at the end of 0:16, throughout 0:17 and ends at the beginning of 0:18? 0:17 would have made more sense then. I still see no deceit, only a good explanation of tides. Like I said, anyone who doesn't want to learn can simply not watch. but there is more! That clip says "EARTH'S ROTATION" too!! Was I right to stop the video at that time?? Did I miss anything? The part that shows up at the end of 0:16, throughout 0:17 and ends at the beginning of 0:18? Yes, that one exactly. The 18-second mark shows it quite clearly. 0:17 would have made more sense then. It would have certainly helped prevent your blunder. Then again, so would you exercising the bare minimum of competence. Certainly. Similarly, if you don't want to hear dissent, you can simply not read the responses to your threads. the 18-second mark is 1-second long. Something that shows up for a tenth of a second can hardly be said to show something clearly. lol - errant claims of falsehood is hardly dissent. I love intelligent exchanges of ideas, but that is sorely lacking as these comments are evidence of. You missed the whole explanation of tides. 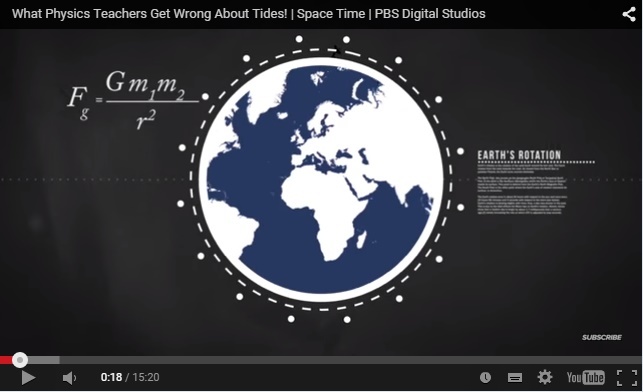 You missed how the typical explanation for how tides work is incorrect in spite of having the right information. You simply missed learning. is an exercise in self promotion. The sea is a living thing, every nanometer of the sea is a mindful sentinel entity, the sea mind the world(the mundo) therefore he show us the tides as people wish them to work. All wrong. The Tidal Forces act upon the Continental Land Masses.. not the oceans. This also explains why lakes (even huge lakes) don't experience the same effect. Additionally, this has much to do with earthquakes, magma creation and the predictable eruption of geysers.